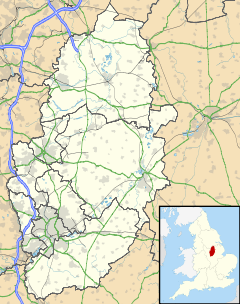 Hyson Green is a neighbourhood in Nottingham, England. It is home to a variety of cultures with a thriving local economy. Hyson Green has the largest ethnic minority population in the city. Since 2006 Hyson Green has seen a larger rise in development and direct international investment than any other area of Nottingham. According to new research Hyson Green has the fastest GDP growth in Nottingham. Hyson Green is spread over Berridge and Arboretum wards of Nottingham. While the local economy is improving, child poverty remains higher than average, as listed in Nottingham City Council's ward profiles. The area is served by Radford Road tram stop and Hyson Green Market tram stop on the Nottingham Express Transit. The opening of the tram system has boosted Hyson Green's profile and helped to regenerate the area. Hyson Green was built on the southern part of the Basford and Nottingham Lings, a large sandy waste of gorse bushes, ling and heather with patches of grass. After the Norman Conquest it became part of the demesne of William Peverel, chief steward to William I in the Lordship of Lenton and Basford. William built Lenton Priory and removed any remaining trees. On the night of 19 October 1330, King Edward III walked along it with a posse of men to apprehend Roger Mortimer, in Nottingham Castle. He would have walked from Low Sands, or Radford through High Sands (now written as Hyson Green). Ecclesiastically Hyson Green was within the Parish of Radford. The borough of Nottingham consisted of three parishes:St Mary, St Nicholas and St Peter; building was restricted to within those tight geographical limits. As the definition was loosened, Hyson Green grew. After the enclosure act in 1798, the open forest at High Sands was cultivated. There were fields and gardens, and there is note of one ancient house and Bobbers corn mill. The first modern house was built in 1802, then in 1820 rows of houses were built in Pleasant Row, Lenton Street, Saville Row, Lindsay Street, and Pepper Street by societies of workmen: stocking-makers and warp hands. The houses cost £70 each, and workmen paid for them in instalments. The upper rooms were used as workshops where the residents installed rented stocking frames. These four-storey houses were spacious with long individual front gardens. These were a change from the confined courts and yards of New Radford, which however were soon to follow. A tea garden and bowling green was made at the "Cricket Players" public-house which was established by John Pepper about 1824. The government of Nottingham was changed by the Municipal Corporations Act 1835. The Enclosure Act, 1844 freed Nottingham's open fields for building. The streets were lit with gas in 1869. In 1875, Hyson Green was a few streets of houses mainly between the tram lines on Radford Road and the Hyson Green Works, a brass foundry, on Gregory Boulevard. There was open country between the settlement and Scotholme House in New Radford. The terraced frameknitters houses had generous gardens. In addition to the brass-foundry there was a lace factory, an Anglican church with attached school and two Methodist Chapels. In Bedford Square and Radford Court (both demolished) were groups of back to back cottages. The Borough Extension Act 1877 brought Basford, Radford and thus Hyson Green into Nottingham. A large number of houses was built by J. R. Morrison about 1880. He died in 1886  In 1889 Nottingham became a county borough under the Local Government Act 1888. City status was awarded as part of the Diamond Jubilee celebrations of Queen Victoria, being signified in a letter from the prime minister, the Marquess of Salisbury to the mayor, dated 18 June 1897. By 1912, this was an area of gridiron streets with densely packed small terraced houses. The generous gardens of the previous generation had been infilled with rows of small cottages  This had become a classic slum, with high infant mortality and a strong self-supportive community. The Hyson Green Flats were built in 1965 and demolished in 1988. They were a well-known landmark in their day and many people really enjoyed living there- due to a great deal of community spirit. There were 593 individual flats and maisonettes. They had a kitchen, separate bathroom and toilet and communal underfloor central heating. Nottingham City Council had built these high-rise and deck access developments using major contractors, notably Wimpey and Taylor Woodrow, who built in off-the-peg schemes. The flats were accessed along 31 high level walkways. There were defects in these estates and legislative and economic changes were also afflicting disproportionately the communities which lived in council rented accommodation. There was dissatisfaction with the council as landlord in this period and its repair schedules. By 1981, renting a council house was less than aspirational. In 1981, there were serious riots across many major cities in England, including Nottingham on the weekend of 10 to 12 July. The main motives for the riots were related to racial tension and inner-city deprivation, together with a distrust of the police and ‘authority’ in general. The riots started on the Friday night on the Radford Road in response to a huge build up of police presence, and moved over to the flats in the early hours of Saturday morning. On the Saturday night the riots moved to the city centre when racists from outside the town had attacked blacks under the cover of the riots. The fighting began as a confrontation with the police using stones and petrol bombs, with shop windows only being broken ‘accidentally’ – but looting developed later; the rioters were always of mixed races, ages, employed and unemployed. Petrol bombs were made and thrown but an early attempt to torch the flats was successfully resisted by the residents. Over 100 people were arrested by the police, but only one man was charged. Prince Charles visited Hyson Green Flats in 1982 – during a fact-finding tour of Britain’s inner cities. 'He had minimum security as he visited the walkways and drank tea and talked with the residents. He left in a yellow helicopter' resident Mark Watson remembers. The cleared area was used for an Asda superstore and low rise, lower density housing. Adjacent to The Forest tram stop is the Forest Recreation Ground, which holds the annual Nottingham Goose Fair and frequent sport matches on the grass pitches. There is a small playground, and several astro-turf pitches. The recreation ground was a race course in Victorian times. Local facilities include a library, now situated in the Mary Potter Centre. The former library building dates from approximately 1890 and has always been a free library. Radford Road in Hyson Green is a busy shopping road outside of the city centre. Radford Road is home to two major Asian supermarkets . dozens of ethnic eateries, supermarkets, jewellers, book shops, barbers and general stores with business owners from Poland, India, Pakistan, Sri Lanka, Bangladesh, Arab world, Somalia, Cameroon, DR Congo, Nigeria, Spain, Kurdish regions, Iran, Iraq and Turkey. Asda also sells Halal food. Muslim Hands has a fundraising office here, Al Ain and Orphans in Deen have premises. The local area has a Czech Republic Church, a Russian Orthodox Church, Nigerian Church, 2 Gurdwara, 3 Hindu temples, a Buddhist temple and 11 Mosques. St. Paul's Church, Hyson Green now housing. Hyson Green Methodist Free Church now a community centre. L12: University Campus - QMC - Hyson Green - City Hospital Island. L14: Nottingham - Canning Circus - Hyson Green - City Hospital - Basford - Bulwell. Tram: Nottingham - Hyson Green - Basford - Bulwell - Hucknall. Tram: Nottingham - Hyson Green - Basford - Phoenix Park. The closest secondary school is the Djanogly City Academy. On the edge of the district are Scotholme Primary and Nursery School, the two Berridge Primary and Nursery Schools and in New Radford, St Mary's RC Primary School. Fred Geary (1868–1955), the Everton and England footballer was born in Hyson Green. He started his career with Notts County. ^ "Neighbourhood images in Nottingham: Social cohesion and neighbourhood change". Joseph Rowntree Foundation. 26 March 2007. Archived from the original on 8 July 2007. ^ "Document Library: Ward Health Profiles 2014-2015 - Internal Network Insight". nottinghaminsight.org.uk. Retrieved 8 April 2016. ^ "NET Nets Top Award". NET website. ^ "Crime statistics, Basford/Hyson Green". Nottinghamshire Police website. 26 March 2007. Archived from the original on 28 September 2007. ^ a b Hyson Green (Plaque outside supermarket). Hyson Green: Asda. 2016. ^ a b c d Mellors, Robert (1914). "Nottinghamshire history > Old Nottingham suburbs: then and now[Radford and Hyson Green] (1914)". www.nottshistory.org.uk. Retrieved 5 January 2017. ^ a b c d "Nottingham City Council - Insight Mapping GIS Mapping". info.nottinghamcity.gov.uk. Retrieved 8 April 2016. ^ a b "Hyson Green History – www.hysongreenhistory.org: The Flats". hysongreenhistory.org.uk. Retrieved 4 January 2017. ^ "Hyson Green History – www.hysongreenhistory.org: How They Looked". hysongreenhistory.org.uk. Retrieved 4 January 2017. ^ a b "Nottingham | Municipal Dreams". municipaldreams.wordpress.com. Retrieved 4 January 2017. ^ Matthews, Chris (2015). Homes and Places. Nottingham City Homes. ISBN 9780993409301. ^ "Hyson Green History – www.hysongreenhistory.org: The Riots". hysongreenhistory.org.uk. Retrieved 4 January 2017. ^ "Remembering a royal visit…". hysongreenhistory.org.uk. Retrieved 4 January 2017. Wikimedia Commons has media related to Hyson Green. "Hyson Green History – www.hysongreenhistory.org: Links". hysongreenhistory.org.uk.